The Easter Bunny is hopping down the trail, and it's high time to decorate your Easter eggs! Think outside the store bought egg dyeing kit, which is typically loaded with artificial colors and superfluous packaging, and make your eggs look fantastic in a more eco-friendly fashion. If you want your efforts to last indefinitely, we suggest you use these reusable ceramic eggs, which are also an ideal choice for vegans. 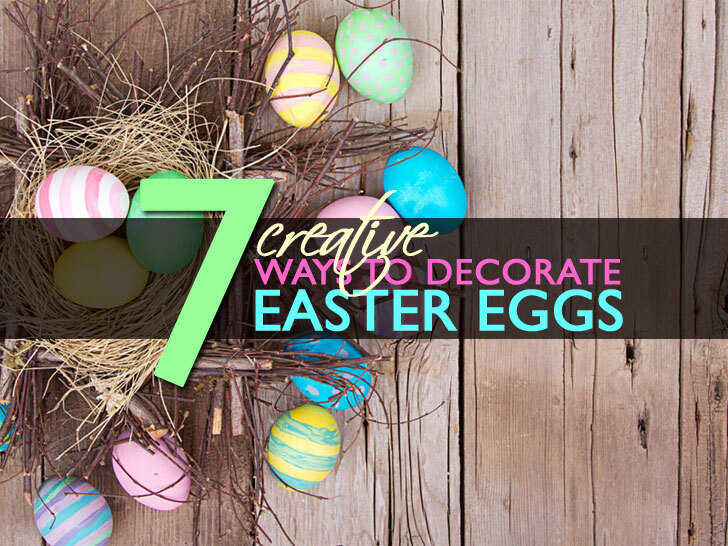 Herein we feature 7 super creative ways to make your eggs spring to life, and you can make them alongside your kids using supplies that you probably already have on hand. This simple way to decorate your Easter eggs from Inkspired Musings is fantastic. The process starts by placing the egg in the lightest dye, followed by wrapping the egg in several layers of rubber bands and then dyeing the egg again in a darker color. You can repeat the process again, placing the rubber bands in different spaces on the egg’s surface. Vicki Chrisman ingeniously upcycles old plastic Easter eggs into something new and beautiful using book print — thereby cracking the code on transforming something commonplace into an absolute treasure. Who knew that a pair of pantyhose and a few fallen leaves could team up to produce such an egg-cellent masterpiece? 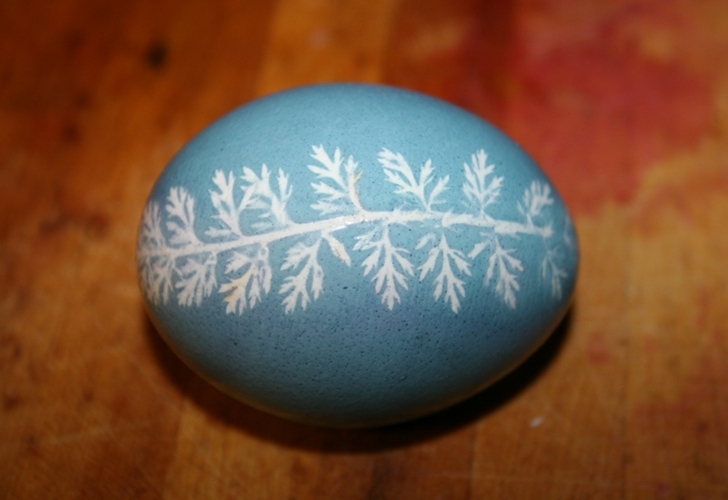 See the full tutorial on how to make leaf imprint eggs using all natural dyes. 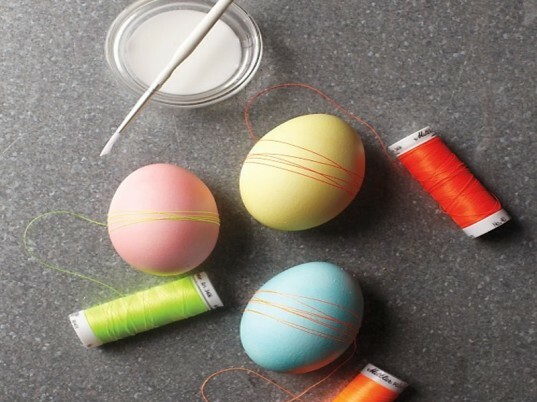 We love these thread wrapped eggs from Martha Stewart. 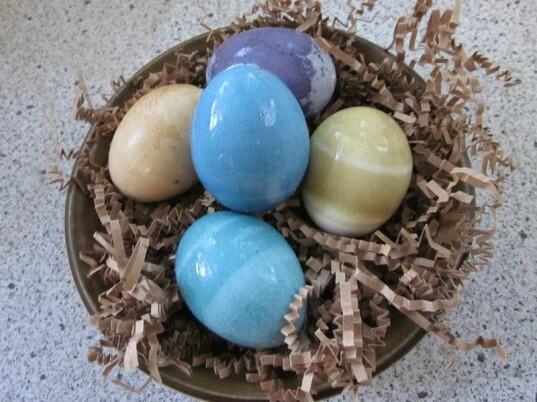 To give them an eco-friendly twist, we recommend using all natural dyes to color the eggs and instead of Mod Podge to attach the thread to the eggs, use a homemade toxic-free glue. Using thread is a great way to add a pop of color that doesn’t contain toxic ingredients. If your husband is like mine, he has a closet full of silk ties that he no longer wears. Instead of tossing them, use them to dye your Easter eggs. Simply cut the silk tie into pieces large enough to wrap around the eggs, wrap the eggs tightly in the ties, and then place inside a white pillowcase and boil in an enamel pot of water with 1/2 cup of organic white vinegar. Remove the eggs from the water, allow to cool, unwrap and admire your beautiful Easter eggs. If you are looking for a simple, traditional way to decorate your Easter eggs without artificial colors – look no further than vegetable dyes. Click here to view the exact recipes that you need to achieve beautiful bright yellow, brilliant purple, elegant gray, and lovely green eggs. Your children will love these jewel toned eggs just as much as their neon counterparts. These baker’s twine wrapped eggs via Lime Riot are similar to the thread wrapped eggs — however in this case the entire egg is wrapped in twine. This would be a fun project for children of all ages and a great way to hone hand-eye coordination for your toddlers (although you may want to let them use a wooden or other unbreakable egg). These eggs boast a playful burst of color that looks amazing in an Easter basket. 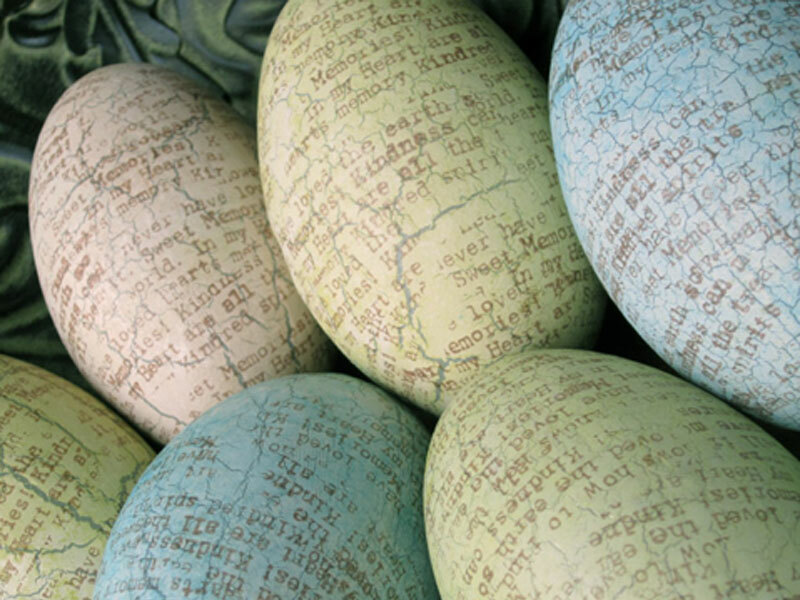 Vicki Chrisman ingeniously upcycles old plastic Easter eggs into something new and beautiful using book print -- thereby cracking the code on transforming something commonplace into an absolute treasure. 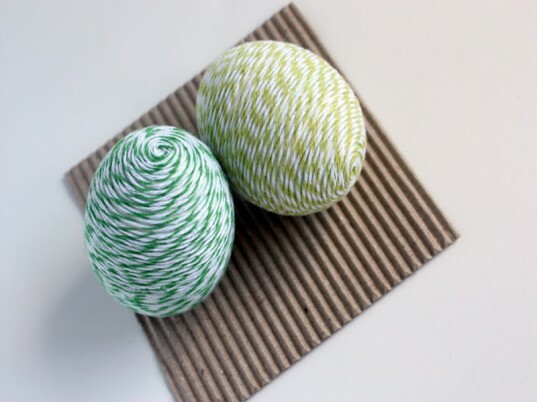 We love these thread wrapped eggs from Martha Stewart. 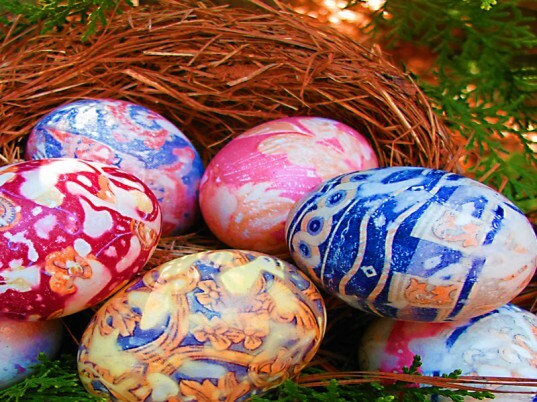 To give them an eco-friendly twist, we recommend using all natural dyes to color the eggs and instead of Mod Podge to attach the thread to the eggs, use a homemade toxic-free glue. Using thread is a great way to add a pop of color that doesn't contain toxic ingredients. If you are looking for a simple, traditional way to decorate your Easter eggs without artificial colors - look no further than vegetable dyes. Click here to view the exact recipes that you need to achieve beautiful bright yellow, brilliant purple, elegant gray, and lovely green eggs. Your children will love these jewel toned eggs just as much as their neon counterparts. These baker's twine wrapped eggs via Lime Riot are similar to the thread wrapped eggs -- however in this case the entire egg is wrapped in twine. This would be a fun project for children of all ages and a great way to hone hand-eye coordination for your toddlers (although you may want to let them use a wooden or other unbreakable egg). These eggs boast a playful burst of color that looks amazing in an Easter basket.